With another week of action behind us, and some more fresh stats to analyze, I’m here to help you with your toughest fantasy football start/sit decisions for Week 10 of the NFL season. Boyd ranks 14th among wide receivers in fantasy points, despite ranking 20th in targets. Target-volume should be even better this week with A.J. Green out (9.5 targets per game) and in a matchup that is more conducive to slot wide receivers (where Boyd runs 73% of his routes). The Saints are giving up the fifth-most fantasy points per game to opposing slot wide receivers, and Boyd has done a good job of making the most of his best matchups. He averages 25.0 fantasy points per game (three games) against defenses ranking bottom-five in fantasy points per game to slot wide receivers, and 24.0 (four games) against defenses ranking bottom-10. In all other games he averages just 11.4 fantasy points per game. Fitzpatrick currently ranks third among all quarterbacks in fantasy points per game (24.0), and that’s despite exiting Week 4 in the second quarter and entering Week 8 on the last drive of the third quarter. Fitzpatrick also ranks fifth-best in passer rating and is our sixth-highest-graded quarterback. In a neutral matchup against the Redskins, he’s worth starting as a mid-range QB1. It’s hard to get excited about Golladay, who has seen just seven total targets over his last three games. Still, I think he’s too talented for a rebound not to occur, and especially with Golden Tate (9.9 targets per game) now out of the picture. Even in this week’s neutral matchup, Golladay is still a borderline WR2 this week. 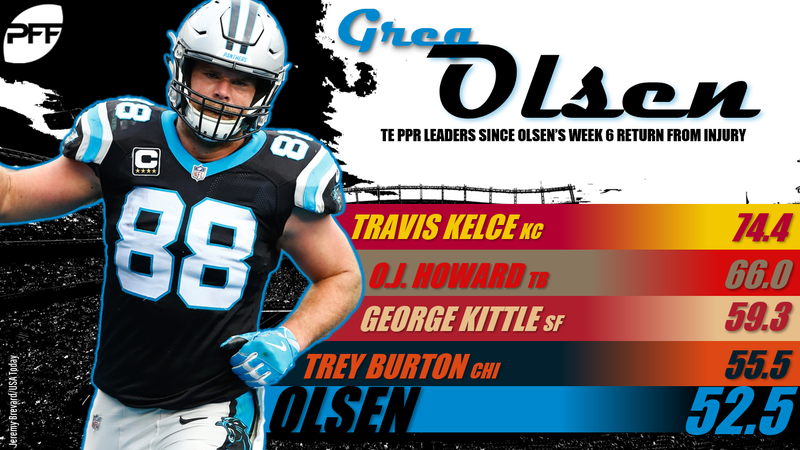 Since his Week 6 return, Olsen ranks fifth among tight ends in both fantasy points and targets. He has an ideal matchup this week, up against a Steelers defense that has seen 25.8% of their receiving fantasy points allowed go to tight ends (second-most). Fitzgerald should be fully healthy off the bye and ranks ninth in targets per game (9.0) over the last four weeks of the season. QB Josh Rosen will have little choice but to lean heavy on Fitzgerald, as 16.5-point underdogs against the Chiefs. Funchess has a tough matchup this week, in shadow coverage against Joe Haden. Across three shadow games, Haden has held Julio Jones, A.J. Green, and John Brown to a combined 20.5 fantasy points. Funchess has just two 100-yard games in his 55-game career and is about as touchdown-or-bust as they come. He might salvage his day with a score, but I wouldn’t count on much more than that. He’s a low-end WR3 this week. Over the past two seasons, Anderson averages 13.8 fantasy points per game in games with Josh McCown under center, but only 8.5 fantasy points per game when McCown has been out. With McCown starting this week, you might think that pushes Anderson in play, but I don’t think so. We’re projecting shadow coverage from Tre’Davious White, who, despite shadowing many of the league’s best wide receivers over the past two seasons, still ranks top-10 (of 92 qualifying cornerbacks) in fantasy points allowed per route in coverage. I want to like Davis, who ranks fourth-best in target market share (30%), but I am worried about his matchup. He’s projected to be shadowed by Stephon Gilmore, our fifth-highest-graded cornerback, and that’s enough to push him down to the mid-WR3-range. Hilton totals just five receptions and 59 yards over his past two games and now gets Jalen Ramsey in shadow coverage. Yeah, no thanks. Peterson averages just 6.8 fantasy points per game and 10.7 touches per game in losses. In all other games, he’s averaging 19.7 fantasy points and 23.2 touches per game. As 3.0-point underdogs this week, that makes him risky enough to downgrade him to the fringe RB2-range. Howard has found the end zone in three straight games, and now gets his best matchup of the season. Chicago is favored by 6.5 points against a Detroit defense that ranks last in yards per carry allowed (5.58) and fourth-worst in rushing fantasy points per game allowed to opposing running backs (17.9). He’s a low-end RB2 in PPR leagues this week. Through three games played, Doyle has played on 87% of the team’s snaps while averaging 7.0 targets (fourth-most) and 12.0 fantasy points per game (seventh-most). Over this span, Eric Ebron played on only 31% of the snaps and averaged just 4.0 targets per game. Doyle is a low-end TE1 this week. Scantling averages 14.7 fantasy points per game across his last four games. Although volume hasn’t been as strong as the production, with Geronimo Allison on IR and in an advantageous matchup, Scantling should be started as a mid-range WR3. I don’t think it’s a coincidence Johnson saw his best usage of the season (nine targets) last week. This came in former running backs coach Freddie Kitchens’ first game as offensive coordinator and in an ideal matchup up against a Chiefs defense that was giving up the most receiving fantasy points to opposing running backs. He gets a similarly terrific matchup this week. The Falcons are currently giving up the second-most receiving fantasy points per game to opposing running backs and have ranked bottom-two for three seasons in a row. Smith has found the end zone in four of his last five games and is coming off of a 60-yard day against the Redskins. Still he’s too risky to start with any confidence outside of in deeper leagues. He averages just 9.3 touches per game across his last four games, and ranks as a low-end RB3 this week. A.J. Green is out for Week 10 and Uzomah averages 4.3 targets per game across his last three games, which I suppose keeps him in consideration given the brutal state of the tight end position this year. Still, I have no interest in him this week against the Saints. For the second year in a row, the Saints rank best in schedule adjusted fantasy points per game allowed to opposing tight ends. Johnson averages just 10.3 carries and 3.2 targets per game when Theo Riddick has been active. That’s not enough to get the job done this week, as 6.5-point underdogs against a Bears defense that ranks second-best in rushing fantasy points per game allowed to opposing running backs. I’ve heard Smith talked up as a top streaming option this week, but I’m not buying it, despite what’s clearly an ideal matchup. An already injury-plagued Washington offense will now be without G Brandon Scherff, G Shawn Lauvao, and WR Paul Richardson for the rest of the season. On top of that, WR Jamison Crowder, RB Chris Thompson, and T Ty Nsekhe are all questionable. Even with a more complete roster, it hasn’t mattered much for Smith, who ranks just 30th in fantasy points per game. McGuire saw surprisingly good usage in Week 9 following an eight-week IR stint. McGuire led the Jets’ backfield in snaps with 36 (of 66), while drawing seven (of 20) carries and five (of eight) targets. After last week’s seven-point loss to Miami, it’s hard to tell if this means New York favors him as their lead back, or if they just favor him as their primary passing-down back. 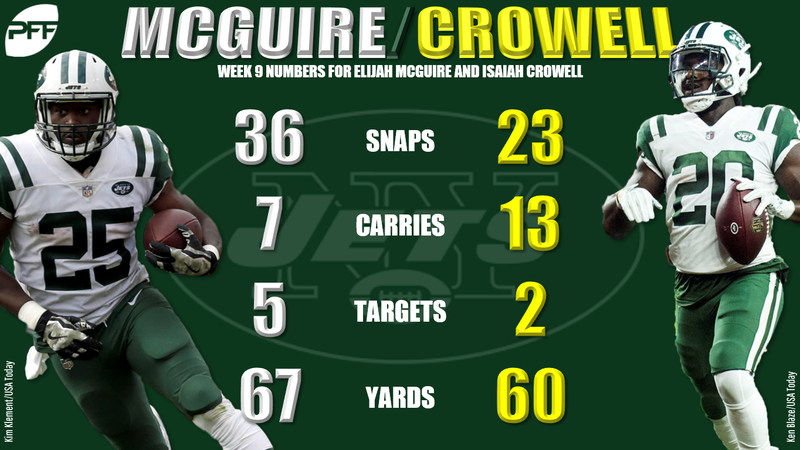 I suspect gamescript might be better suited for Isaiah Crowell this week, as 7.0-point favorites against the Bills, but volume should still be good enough for McGuire to return high-end RB3 numbers. I have Crowell a little higher as a low-end RB2. Though McDonald will continue to split time with Jesse James, he has seen at least five targets in five of seven games. Now he draws the ultimate tight end matchup in the Panthers. Carolina is giving up the most fantasy points per game to opposing tight ends, ranks worst in schedule-adjusted fantasy points per game to tight ends, and is giving up the highest percentage of their receiving fantasy points allowed to tight ends (31%). Mayfield has been hit-or-miss for fantasy but has multiple touchdowns in three consecutive games and is coming off one of his best outings of the year – perhaps in part thanks to new OC Freddie Kitchens. This week he draws an Atlanta Falcons defense that ranks fourth-worst in points allowed per drive, fifth-worst in opposing passer rating, and has seen 74% of their total yards allowed come via the pass (tied for third-most). Harris recorded 10 receptions for 124 yards on 12 targets last week. That, seemingly, came out of nowhere, after averaging just 3.0 targets per game over his previous three games, but did coincide with a soft matchup against the Falcons (fourth-most fantasy points per game to slot wide receivers). His matchup this week is even better, against the Buccaneers who are giving up the most fantasy points per game to slot wide receivers. Though, if Jamison Crowder returns this week, it might be worth looking elsewhere.